Fantastic views of the Parthenon. Oozing glamour and old world charm, with chandeliers and period furnishings creating a unique neo-classical look. 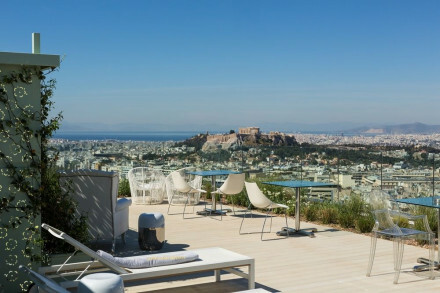 Honeymooners take the penthouse suite with private outdoor pool overlooking the famed Acropolis- you can't get more romantic. Paid parking is available at a site nearby. Paid Wifi is available in the bedrooms. Boasting al fresco dining at wonderful views. Sip cocktails on the seventh floor balcony over looking the spectacular Ancient Citadel, The Acropolis. 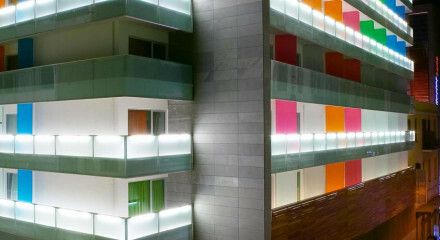 The trendy and cosmoplotian area of Kolonaki is only a 15 minute walk. Wander the labyrinthine streets of Plaka, absorb the beautiful neoclassical architecture in this ancient neightbourhood. 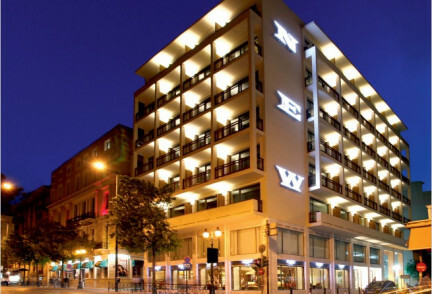 The hotel backs onto Voukourestiou Street, Athens fashion district with high end shopping and designer boutiques. A short walk to the Acropolis, containing the remains of several ancient buildings, the most famous being the Parthenon.